Free birthday invitation templates make it fun and easy to invite friends and family to an upcoming celebration. Whether you’re planning something last minute or weeks in advance, our free printable birthday party invitations will ease your party-planning pains. Your invitation card will set the scene for the upcoming party. Picking the right card is an important part of planning a successful event. Should you use the free printable, customizable invitations from this page, or buy an invitation box from a store? When should you choose an invitation? How can you make invitations match your needs? What criteria to consider when selecting an invitation card? See our tips on selecting the best birthday party invitation to find out. 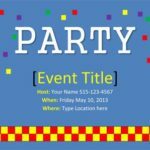 Selecting the best birthday party invitation for your needs is a multi-step process that begins with smart party planning. Know when to start looking. Choose invitations midway through the planning process, after you’ve decided on the decor and themes. This will enable you to pick an invitation that’s related to the event. Ask the relevant questions. Is there a party theme? What colors have you selected for the napkins, tablecloth, paper plates, and streamers? What is the age being celebrated? Answering these questions will help you select an invitation that makes sense for the birthday party being planned. Look for invitations that match your criteria. Standard birthday invitations will provide information about the party date, time, food, and guest of honor. If you need to provide some other party details to your guests, you may need a customizable invitation with extra space for writing messages or an RSVP card. Consider the physical characteristics of the card. Birthday party invitations come in different shapes and sizes. Cards of an unusual height or width may be more expensive to send in the mail. You may need to prioritize cost, and worry less about style, in order to stay on budget. Get the opinion of the person of honor. If you’re planning a birthday celebration for a friend, a relative, or a child, show them different invitation options you selected. Including the guest of honor in these decisions ensures no party-day disappointments. Make changes as needed. Most downloadable invitations can be customized. When looking at options, remember that not all templates are set in stone. Consider the ways in which each one could be changed to meet your needs. Deleting or adding different elements could make a so-so card into the perfect invitation for your event. Once you’ve selected the right card, it’s time to fill each one out to send to the appropriate person. Get creative to show guests that your upcoming birthday party is going to be a blast. Use a calligraphy pen to give the card a beautiful, hand-written look. Decorate the card with ribbons and bows. Personalize each invitation to the recipient. Enclose a picture of the birthday boy or girl to make the invitation more personal. You will find 20+ printable birthday party invitations for different themes and events below. Find the perfect card for your special event, and then download and customize the invitation that meets your needs. Easy to use. Printable birthday invitation templates are easy to download. Customizable Invitations can be customized to meet your needs. Economic. You can use multiple types of our free printable invitations for one event without paying extra. Print as many or as few as you need. These are just a few previews of the kids birthday invitation templates we created. Please see this page for first birthday, animal birthday invitations, and other birthday invitation card ideas. No party theme? No problem. Please see Party Invitation Templates for simple neutral designs. This invitation features balloons, confetti, and streamers in bright, joyful colors to celebrate your big day. Space for party information, including the host's email address, is included in three symmetrical columns near the bottom of the invitation, creating a simple and streamlined look. Nature lovers and social butterflies alike will delight in this card template, featuring a border of delicate pink and green vines streaming from a pink birthday cake. This card includes plenty of space for party information and notes for guests without appearing cluttered, and may be a perfect option for a social gathering planned for the outdoors. When it comes to fun birthday party invitations, this one takes the cake. Featuring a snorkeled cartoon child joyfully playing with a beach ball in the waves, this pool party invitation is no-frills -- all party information is contained within a single box, allowing you to focus on the invitation's bright colors and happy tone. This invitation is perfect for an amusement park party or a simple backyard splash-fest. While birthday invitations often seem to focus on primary colors (as well as party favorites like purple, pink, and orange), this understated card features a scattering of confetti above a modest pair of gifts in earthy green, rust, and goldenrod tones. Printing this on recycled card stock can create an even more natural feel. When you invite people to your party with this cheerful invitation, they're sure to RSVP yes. Featuring star-shaped confetti, ribbon banners, and a festive birthday cake flanked with two small flags, this invitation conveys a patriotic and summery feel. This gold-bordered party invitation is eye-catching and unique, with an abundance of white space that draws your eye to the relevant information. Abbreviated party details are entirely contained within a single circle divided into four parts, upping the sophistication-ante of this unusual invitation. What better way to celebrate your special day than by pampering yourself (and your guests) with a spa day? This spa-themed invitation features relaxing purple and taupe tones, depicts some of the mud mask and cooling cucumber treatments you and your guests may love, and comes in the perfect shape for folding.